This is one of my favorite cake recipes because it’s cinnamony enough for brunch and sweet enough for dessert. I actually think my mom found it years ago in a Cooking Light magazine, and it has become a staple at my parents each Fall. In a large bowl, cream the butter and add the brown sugar and 1/2 cup of the granulated sugar and beat until smooth and light. Add the egg and vanilla and beat well. 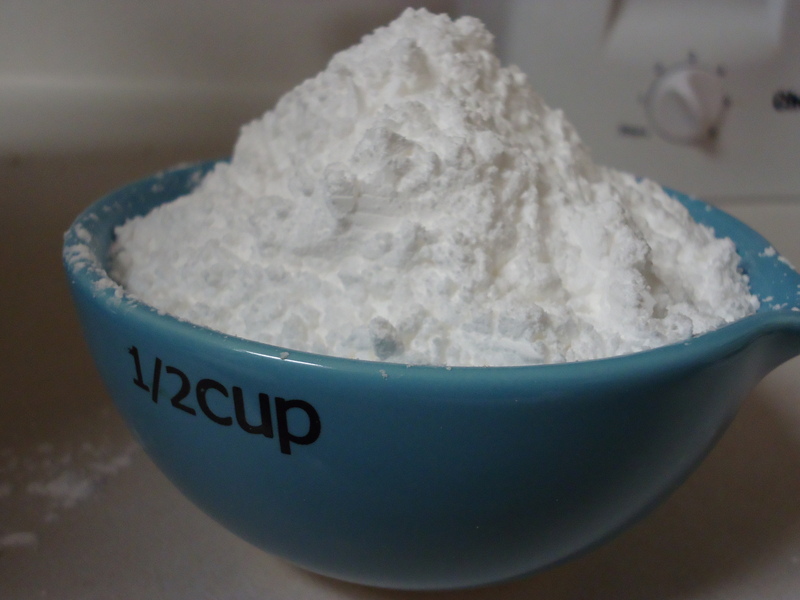 In another bowl, combine flour, baking powder, baking soda and salt. Stir well or whisk gently to blend. In several additions, alternately mix the dry ingredients and the sour milk into the butter mixture, beginning and ending with the flour. Stir until the batter is just mixed. 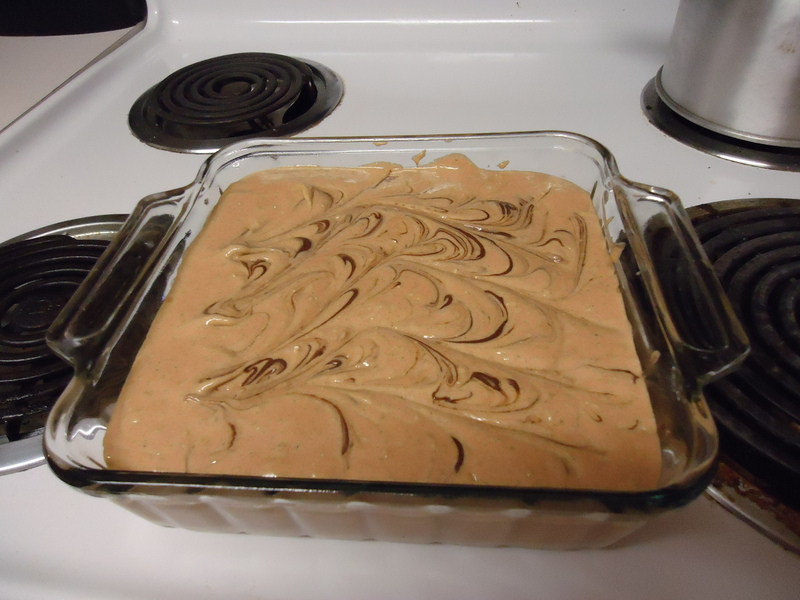 Spread about 2/3 of the batter into the greased baking pan. 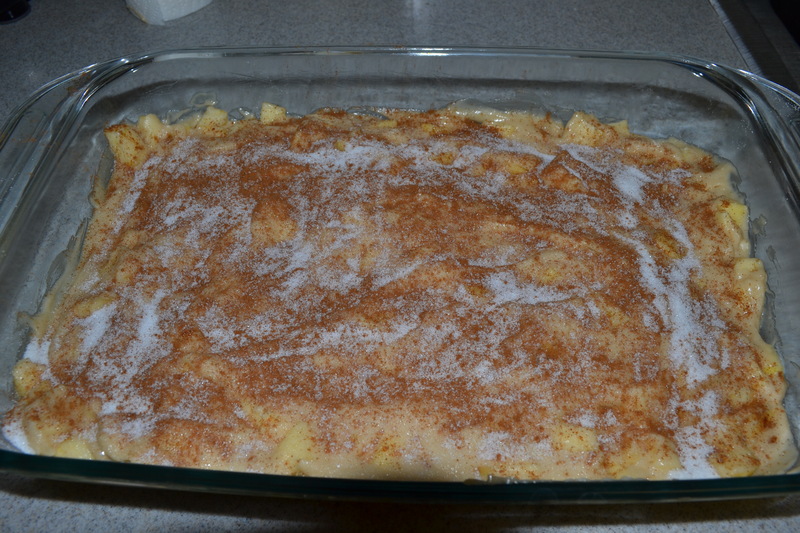 Layer the diced apples over the batter and then cover with the rest of the batter. Combine the remaining 3 tbs sugar with the cinnamon and sprinkle evenly over the top. 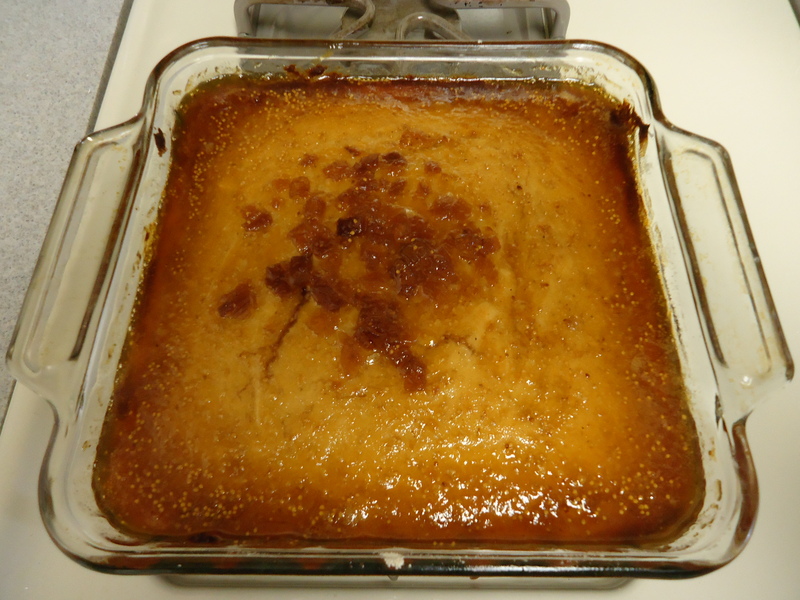 Bake 40 – 45 minutes, or until the cake is golden brown on top and beginning to pull away from the sides of the pan. A tooth pick inserted into the center should come out clean. 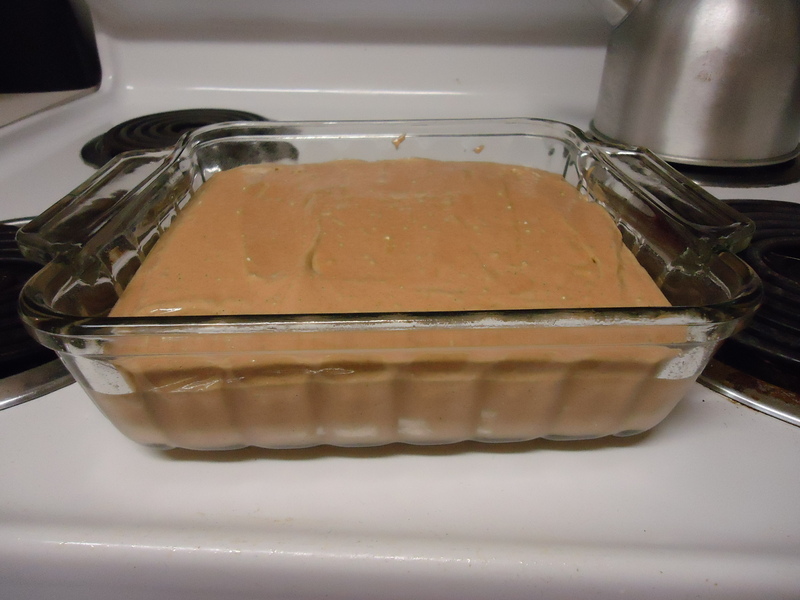 Let the cake cool in the pan before cutting into squares to serve. I’m excited to share this new recipe with you as it is my first cake recipe from scratch! If you bake you understand how truly scary that can be (ahem Thundercake anyone). Unlike cooking, baking is a science and measurements matter. Some of the most important ingredients for my Golden Fig Cake are pictured below. Preheat your oven to 350 degrees. Butter and flour an 8 x 8 baking dish. 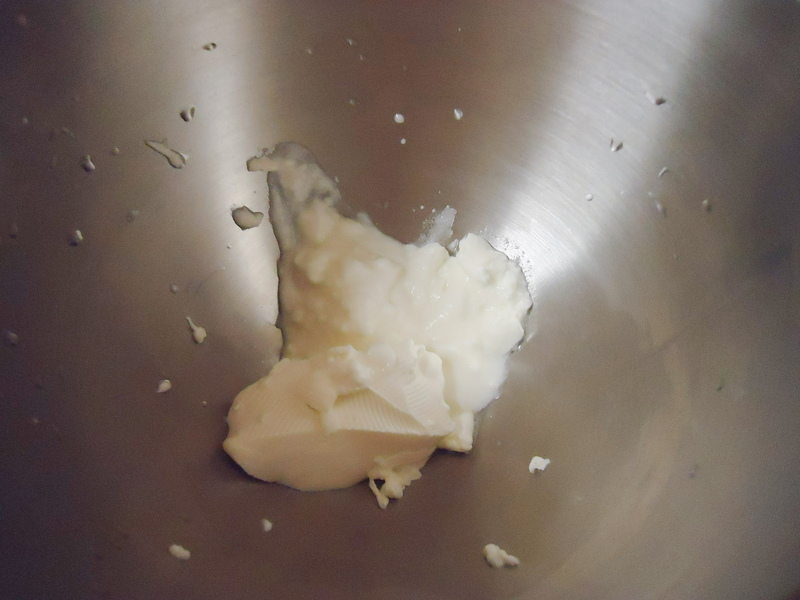 Over medium-low heat, melt the butter until it takes on a light brown color (approx 4-5 mins). Keep an eye on the butter, as browned butter equals delicious and burned butter equals ruined. 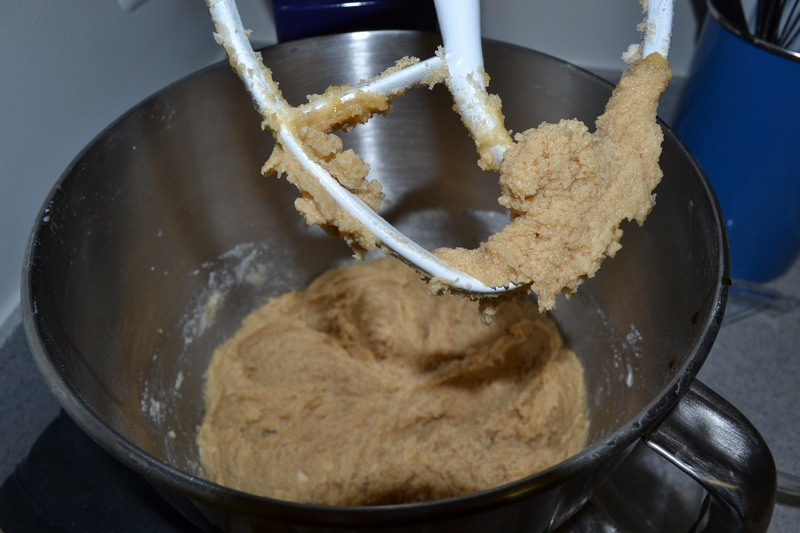 Transfer browned butter to the bowl of an electric mixer and add brown sugar and granulated sugar. Use the paddle attachment on your mixer, and add the eggs one at a time while using the low-speed. Once incorporated, add the vanilla extract and yogurt. Mix on low until blended and creamy (approx 2 mins). In a separate bowl, whisk together flour, baking powder, baking soda, salt and nutmeg. 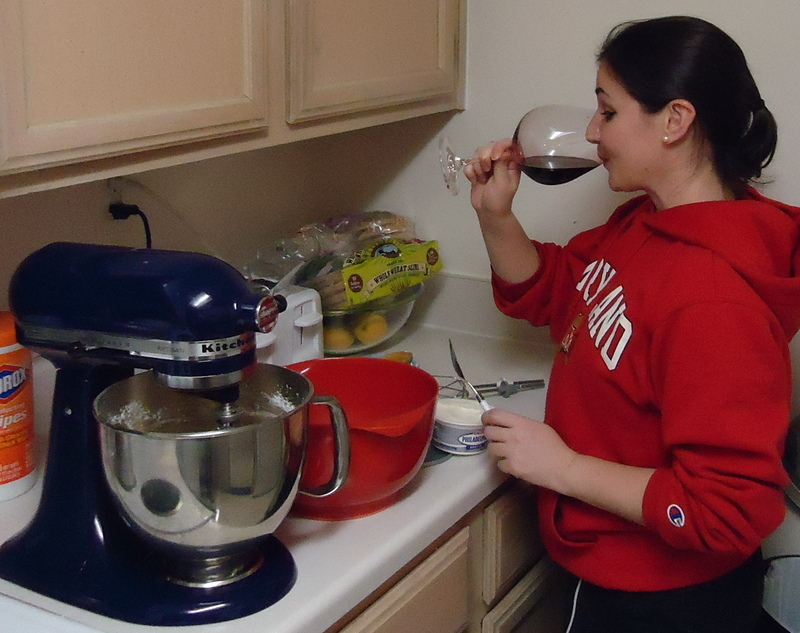 Gradually add the dry ingredients to the wet mixture in the mixer using the low-speed. 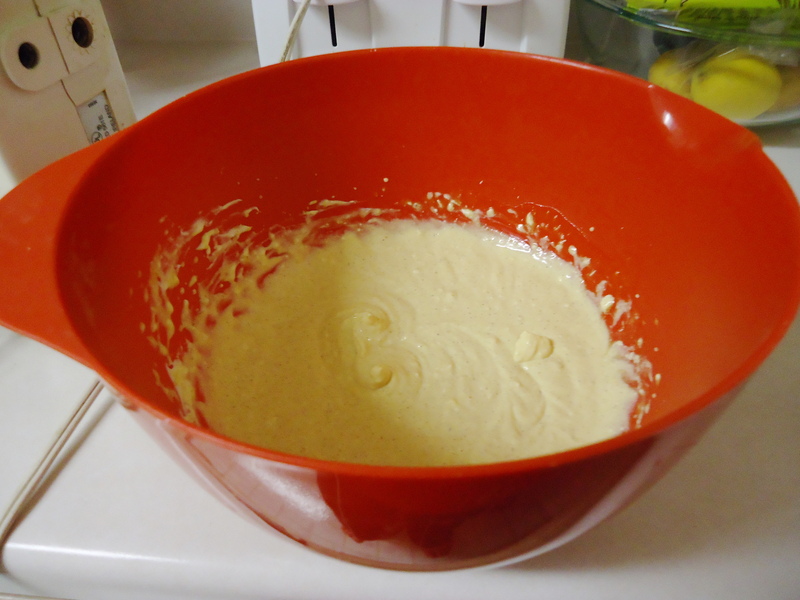 Mix just until batter is combined. Spoon the batter into the prepared pan and spread it out with a wooden spoon. Bake the cake for 40 mins, or until edges begin to take on a lightly golden color and a toothpick comes out clean. The rest of the cake will still be very pale in color. With about 7 mins left on your cake, melt fig spread with 2 tbs water on your stove top over medium low heat. The spread will resemble a liquidy glaze with chunks of the fig in it. Once the cake is finished baking, pour fig glaze over cake, and return to oven for 8 mins. The glaze will be bubbly and take on a golden color when it is finished. Cool completely before serving. This cake is moist and tangy, without being overly sweet. It would be delicious served warm at breakfast with coffee, or for dessert with a scoop of vanilla bean ice cream. I hope you all enjoy it and feel free to lie to my face if you don’t! Yesterday evening the DC area got our first real snow storm of the year. But it wasn’t your average storm, instead we had thundersnow and thundersleet. The storm moved in quickly, the traffic was horrific, and many areas lost power. I was one of the few lucky ones to make it through the storm without issue, so I decided to celebrate by making Thundercake. 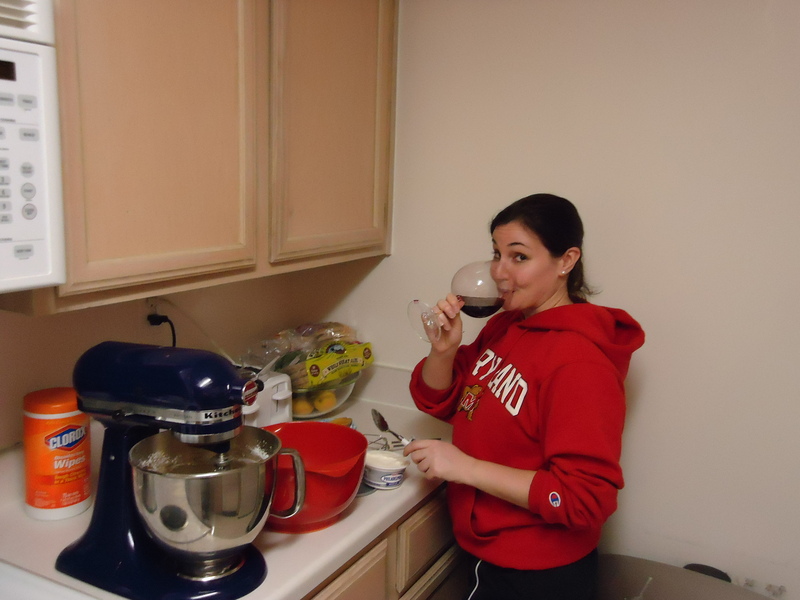 Well, actually I started off cleaning, then was invited for a glass of wine with one of my apt. 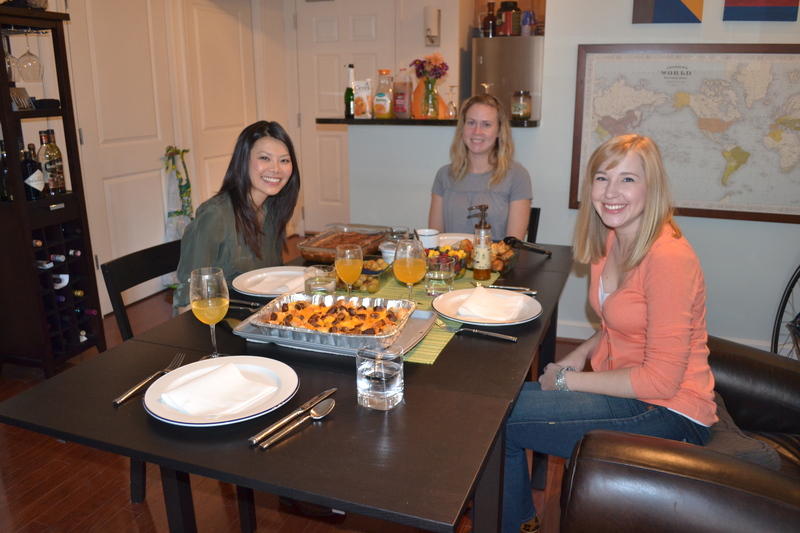 friends, then made dinner, and that all led to the thundercake experiment. Honestly, what else were we supposed to do while we were snowed in? This is the story of a cake using some of my favorite flavors and the icing that almost wasn’t. Everything started out so simple. 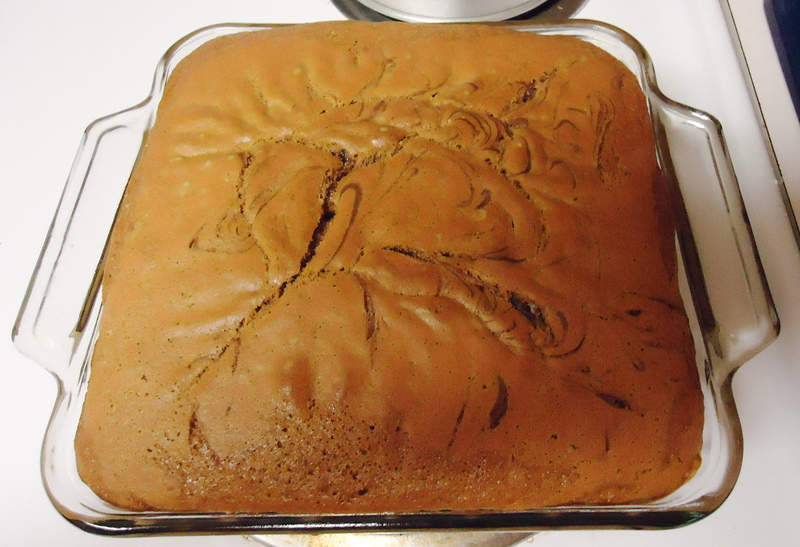 I pulled out a box of leftover spice cake mix, canned pumpkin, nutella, and cream cheese from the fridge. Most people have these ingredients lying around in a snow storm right? Back to the cake. I followed the box instructions that said to combine the mix with 3 eggs and vegetable oil. 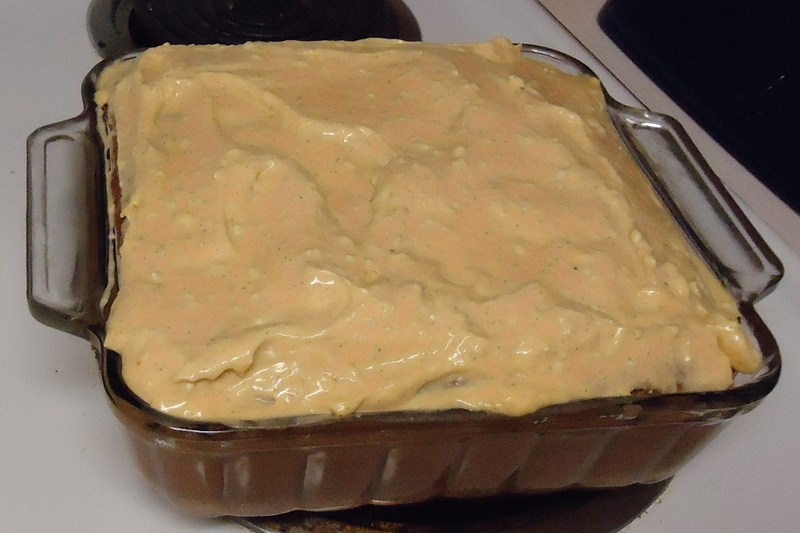 I then mixed it until the ingredients were incorporated and poured the batter into a greased baking dish. I decided that this spice cake needed a little something extra, so I added 4 tsp of nutella to the batter and ran a knife through the nutella to make a pretty swirl design. I popped the cake into a 350 degree preheated oven and baked for about 38 minutes. Now it was time to find a frosting recipe. 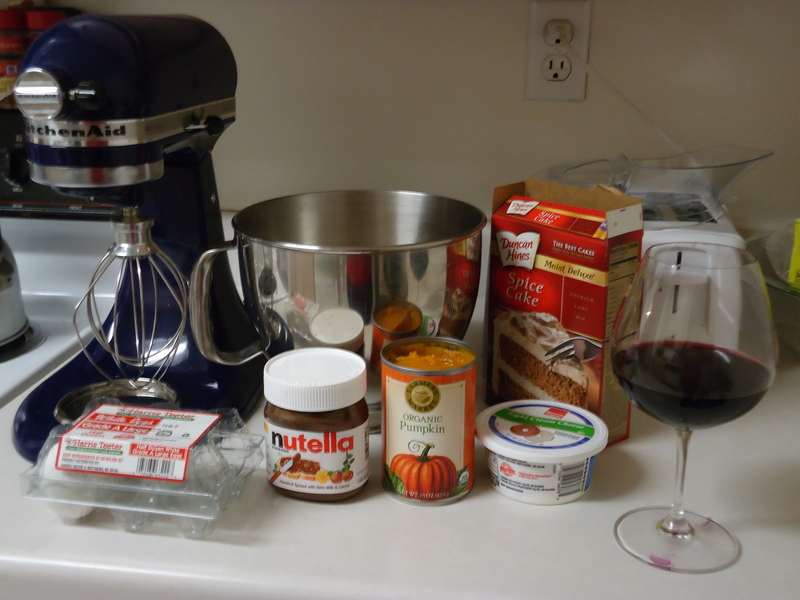 I decided to turn to my trusty food network website and found a Rachael Ray recipe for pumpkin cream cheese frosting. Perfect! I looked at the recipe and realized I didn’t have everything I needed. That should have stopped me in my tracks, it didn’t. Too late to turn back, I needed frosting stat. So, I tried to find similar ingredients in my fridge/cupboards and make substitutions. The recipe called for 8 oz of cream cheese and I only had 4 oz, so I substituted 4 oz of nonfat plain yogurt to get the tang. Strike 1. 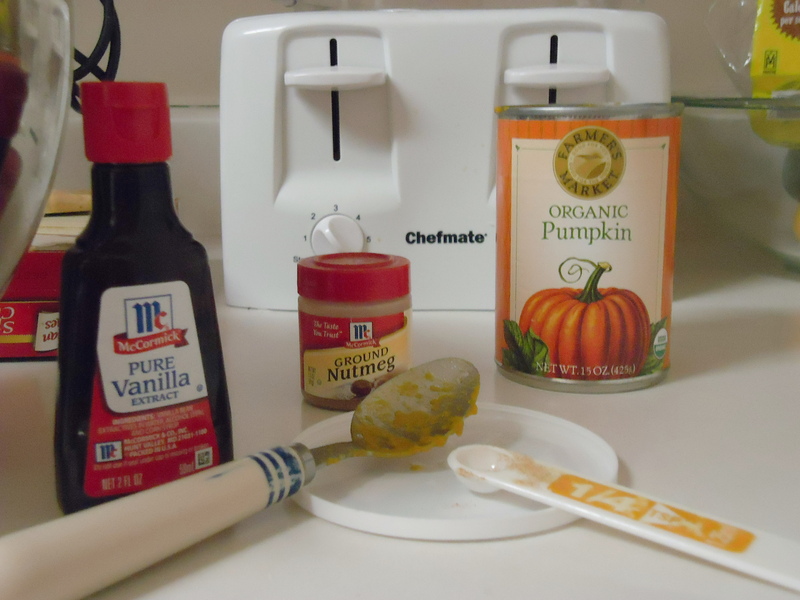 The recipe then said to add 1/2 of a can of pumpkin, 1/4 tsp nutmeg, and 1/2 tsp vanilla extract. I was able to do this correctly, but was lacking an orange to zest, so left this out. Strike 2. I was then supposed to beat all of these ingredients together and slowly add 3 and 1/2 cups of powdered sugar to the mix. I was a 1/2 cup short, but actually this worked out fine because 3 cups was already tooth-achingly sweet. No strikes there. Try as I might I could not get my frosting to whip up. I really needed more cream cheese or yogurt with a higher fat content to thicken it. So after bringing in RB and G for a cake consult, I decided to add more yogurt and the remaining 1/2 can of pumpkin. Strike 3. This produced what can only be described as sweet orange gloop. I was about to throw in the frosting towl and settle for boring spice nutella cake on it’s own (I know I’m being overly dramatic but I REALLY wanted frosting). When my two friends gallantly offered to hit the market in our basement in search of more cream cheese while I resumed pouting over my bowl. A few quick minutes later I was back in business. I whipped the new 8 oz container of cream cheese with 1/3 or 1/4 of the sweet orange gloop. I honestly have no idea how much I poured in and was beyond precise measuments at this time. To my surprise, this combo made an amazing thick and tangy cream cheese frosting. Seriously, this stuff was crazy good. As in we were all scraping the excess out of the mixing bowl after the cake had been iced. A true thundercake miracle! The cake still looked a bit orange and gloopy, but it’s always a good sign when your friends say hurry up and take the picture I want a piece! My lessons learned were that it pays to have good friends during a snowstorm, it’s nice to have a market in the basement of your building that is open during said snow storm, and finally, you should always add more cream cheese.